It’s been a while. And so much has gone down since we last blogged! We’ve completed an international film festival run ending things off at NC’s own marvelous Cucalorus Film Festival. We’ve released the full film to the world via Amazon Prime. We’re now sharing almost an hour or behind the scenes material with you in the videos below. 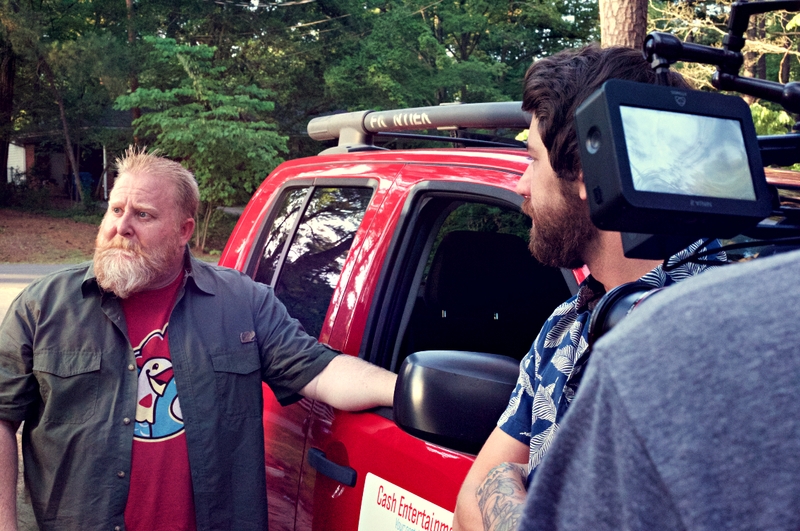 These intimate interviews with our cast and crew shed light on the passion and triumph that went into making this microbudget independent feature film. It’s our first anniversary! As I sit here typing those words it feels quite surreal. I wanted to write this post not to talk about the ways to make an indie feature (I’ve written several of those | if you’re interested) but more about what it feels like to take that leap and the benefits of doing so. June 14th, 2015 started like many other days. My alarm went off, I went downstairs for a cup of coffee, I read some emails. But I did those tasks in all of three minutes, then I was out the door speeding off towards the first day of the rest of my life as a first time feature filmmaker. The resulting experience was a whirlwind, and before I knew it a little over two weeks (containing only 10 production days) later it was over. Wow. Literal whirlwind. June 14, 2015. It’s a funny thing making your first feature film. At least in the independent microbudget fashion in which we made Son of Clowns. There is really no guidebook, you wing it and hope it works. Well… “wing it” with about 50 hours of pre-production. Still. It’s on you to create your film. There is no studio holding your hand, no checks to cash, no budgets to balance. Just that story and you. It’s the most freeing and terrifying experience I’ve ever had. And I yearn to do it again soon. I say that word because I truly feel that one year later as it stands this film has transformed me beyond being just a filmmaker. It’s required more dedication that anything I’ve ever done before it and thats as it should be. Encompassing all that goes into the craft of filmmaking while pulling and learning for just about every other art form and profession imaginable. Oh the things they don’t teach you in film school. I implore everyone out there who has even had the smallest inkling about making a film to do so. I encourage you even more so if that film is a feature. Because in deciding to do so you will be challenged as an artist. You have to get creative. Your story will demand you to prove your worth towards it. And an environment where you are challenged is one where you shall grow. Not only as a filmmaker but as a storyteller and artist. I created the video below today about this very topic to allow myself to reflect in a more personal manner. No fancy Youtube cuts. Just me, a camera, & a few lessons I’ve picked up along the way. 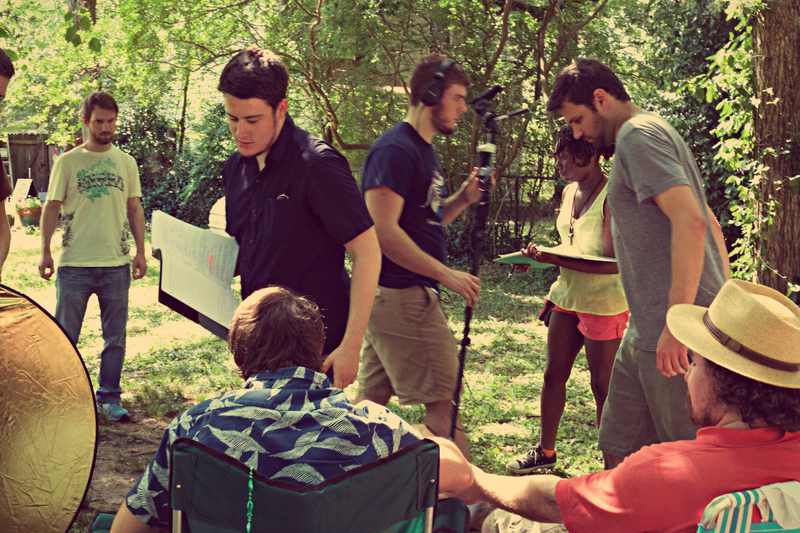 Making a feature film is part improvisation & part planning at an obsessive compulsive level. And it’s that ying/yang relationship that will bind your piece and all of the folks who you’ve brought together to tell your respective story. Thank them, honor them, and treat them right. They are your backbone. I know with Son of Clowns at the end of the first day I had a new family. People who I could call on for future projects, or just simply hang out with. When you work on something like this (during one of NC’s hottest summers) it will test you, and you’ll have to want it. You want to tell a story that in our case is distinctively North Carolinian. You make a choice to go into the battle of production so to speak with your fellow cast/crew acting as your soliders. And maybe… Just maybe you’ll pull off making a feature film. But first you’ll have to try. And I’m really damn glad I did. PS: Stay tuned with us in the coming weeks for more updates! Including news on future screenings, film festivals and even our VOD release! Hudson Cash is the son of clowns. Played by Adam Ferguson, Hudson is a struggling actor whose return home sets in motion the drama at the center of the film. Yet the son of clowns isn’t the only character with a significant role in Son of Clowns. The clowns themselves, along with their circus companions, make for quirky characters viewers won’t forget. Eric Hartley (Dad) and Adam Ferguson (Hudson) during an emotional scene. April Vickery (Mom) was also part of “Displacement Welcomed.” She played a principal supporting role as a homeless woman with a troubled past, and her performance earned her the “Best Supporting Actress” award at the 2015 Eastern North Carolina Film Festival. A multitalented artist, April began acting at 14 and has also pursued music and dance. In addition, she recently finished writing her first feature-length screenplay. Adam Ferguson (Hudson) and April Vickery (Mom) laugh between takes. In addition to the clowns, Cash Entertainment stars the strongman Angus, played by Rob Kellum. Professional wrestling fans across the country know Rob as The Stro (short for The Maestro of Wrestling) or “Papa” Stro. The grandnephew of Hall of Famer Gorgeous George, Rob began his professional wrestling career in 1990 and has gone by multiple names, including Gorgeous George III. He has wrestled for several organizations during his wrestling career, including the WCW, and he faced Sting on August 14, 1993. The Stro is currently the UPWA Heavyweight Champion and defends his title in Wilmington on March 26. “He may be a tough guy in the ring, but, in person, Rob is the nicest guy you could meet and was a delight to have on set,” recalls producer Bradley Bethel. 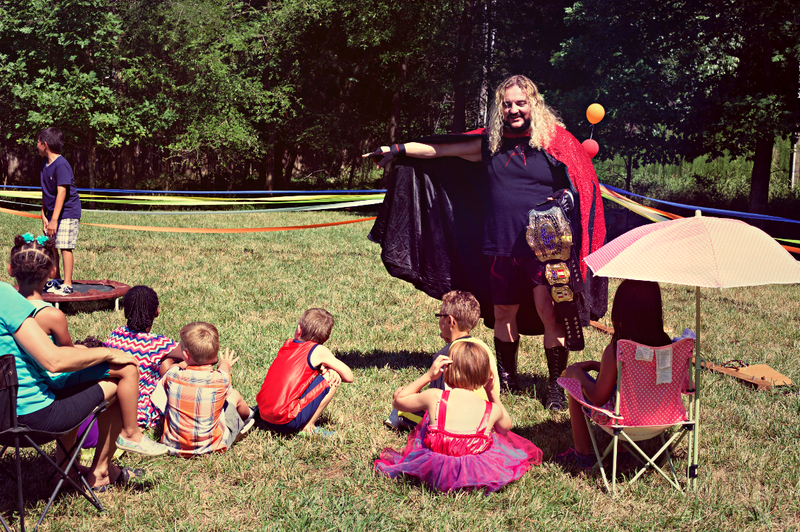 Rob Kellum (Angus) entertains some children and their parents during a circus party scene. Cash Entertainment’s DJ is Hudson’s brother, Jabari, played by Darryl Postley Jr. “When Darryl auditioned, I knew right away he would be great for the role, and he ended up being amazing,” says Kidd. Darryl hadn’t acted in three years before auditioning for Son of Clowns, but he says the role of Jabari was the perfect opportunity to get back into acting. Jabari is an aspiring rapper, and Darryl himself is one part of the rap duo Coma Goat. Darryl’s favorite scene in Son of Clowns involves painting a picture for Jabari’s album cover, but he says you’ll have to see the film yourself to find out what makes that scene so great. A circus wouldn’t be a circus without acrobats. Cash Entertainment’s acrobats are Hudson’s sister Claire, played by Kirsti Leighton, and her partner Sara, played by Nikko Smith. Kirsti graduated from Slippery Rock University with a degree in Dance, and Nikko is currently studying acting at Coastal Carolina University. In their roles as acrobats, Kirsti and Nikko were part of the film’s most challenging scene, a stunt involving Angus and a swing set. “We couldn’t have gotten that scene right if the actors hadn’t been committed, but they were great, and we pulled it off with grit and style,” recalls Kidd. 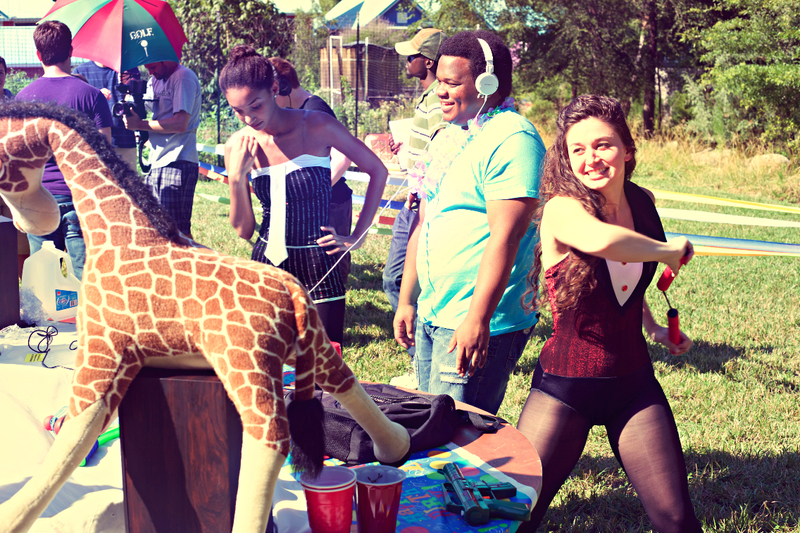 From left to right: Nikko Smith (Sara), Darryl Postley Jr. (Jabari), and Kirsti Leighton (Claire) have some fun during the circus party scene. Real-life magician Shaun Jay also contributed to the film’s big circus party scene. 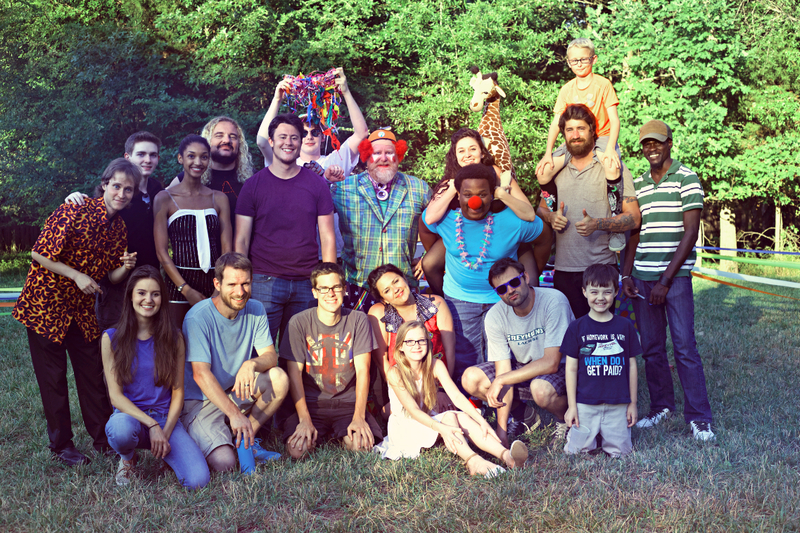 Shaun has been performing magic in the Triangle area for nearly decade, and he dazzled the cast and crew with his tricks, adding spectacle to one of the film’s biggest scenes. Although a minor part, the role of Cash Entertainment’s behind-the-scenes assistant, Tony, is nonetheless memorable. The actor behind Tony is Jackson Honeycutt, a young musician and multitalented entertainer whose comedic timing, everyone on set agreed, is brilliant. Last year, Jackson’s music video for “Sweetheart I’ve Noticed” (directed by Evan Kidd) earned him a Carolina Music Award, and two of his songs are featured on the Son of Clowns soundtrack. Singer-songwriter Jackson Honeycutt having fun in the role of circus assistant Tony. The SON OF CLOWNS family after a long day on set. The world premiere of SON OF CLOWNS will be April 3 at The Cary in Cary, NC. You can purchase tickets here.